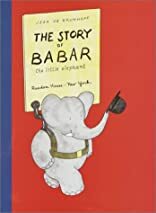 The Story of Babar--the early adventures of the enduring, endearing elephant--was written in 1931 by French writer Jean de Brunhoff (1899-1937). Since then, it has been translated into at least 12 languages. It's amazing how much can happen to one little elephant in the course of one little book: Babar loses his mother to a hunter, wanders into the city, gets a new wardrobe, becomes the hit of high society, marries his cousin C�leste (totally acceptable in contemporary Elephantine society), and is crowned King of the Elephants.